This easy dish makes for the perfect weeknight meal. Feel free to change up the dressing by substituting basil, cilantro or an herb of your choice in place of the dill. Cooked quinoa also keeps well in the refrigerator, so you can always save yourself time by doubling (or tripling) this recipe and enjoying the leftovers for easy lunches or dinners. 1. Add quinoa to a medium pot. Add water and bring to a boil. Reduce heat to low, cover, and cook for 15 minutes, or until quinoa is tender and water has evaporated. Remove lid and fluff with a fork. 2. Meanwhile, add all of the ingredients for the Creamy Dill Dressing to a food processor. Process until smooth. 3. 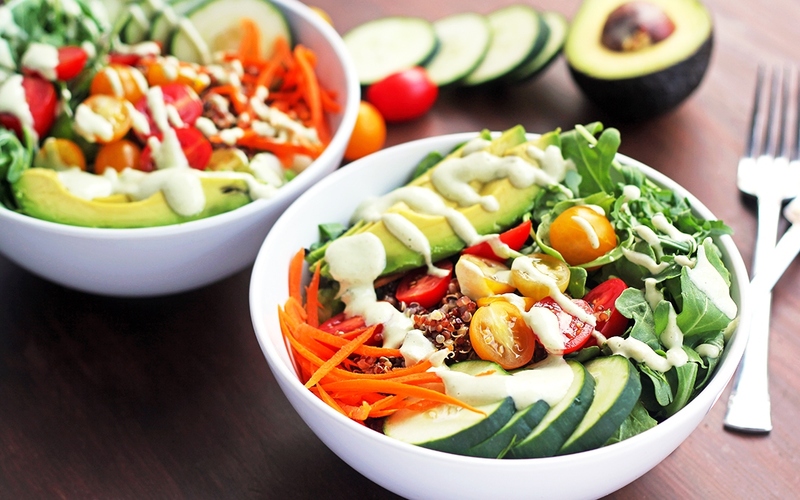 Divide the quinoa between two bowls and top with the arugula, cucumber, carrot, tomatoes and avocado. Drizzle with the dressing and add salt and pepper to taste, if desired.